The Easy Hollower No. 3 is designed for undercutting the sides and rim of the vessel while leaving a smooth finished surface. 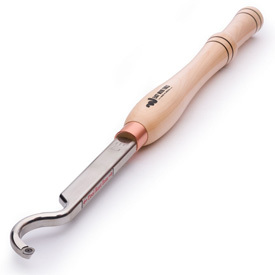 Ideal for woodturners of all skill levels, Easy Wood Tools™ Easy Hollowers combine the benefits of the Easy Wood Tools™ razor sharp carbide cutter with a precision milled flat tool shank for stability and strength when turning small hollow forms. Comments On Jul 08, 2015:This Easy Wood tool is a great confidence builder. I would get catches often with my other tools. It works so effortlessly that I'm willing to try turning vessels I would not have attempted before. Comments On Dec 28, 2014:Got this and a number 2 hollower for Christmas. I had not done much hollowing in the past because the tools that I had to use, just were hard to use and control. This one is great. I was able to working it thru a 5/8 inch hole easily and it cuts fast. The flat shaft really is good helping prevent tool rotation. There will be lot of Christmas ornaments turned for next Christmas.